“It’ll be amazing,” they said. “A trip of a lifetime,” they said. 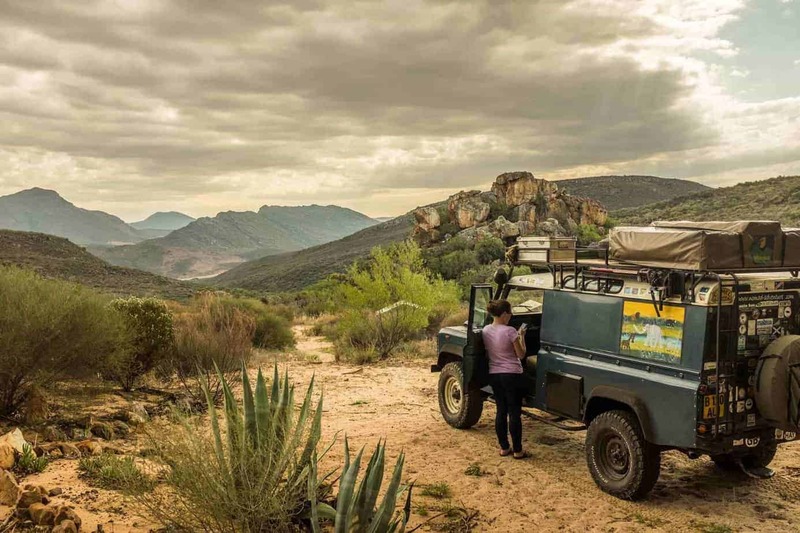 Every day, we want to believe that driving through Africa in our ’91 Defender named Maggie is an incredible, once-in-a-lifetime experience, but the truth is that it doesn’t always feel like rainbows and butterflies. At times it can be really, really hard, but it’s exactly because it’s hard that makes the journey all the more rewarding. 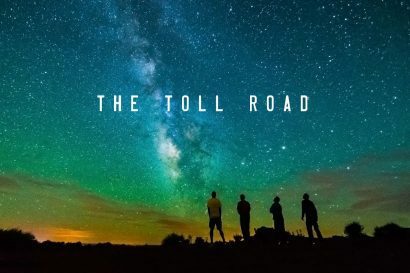 So without further ado, here’s our list of highs and lows of life on the road. 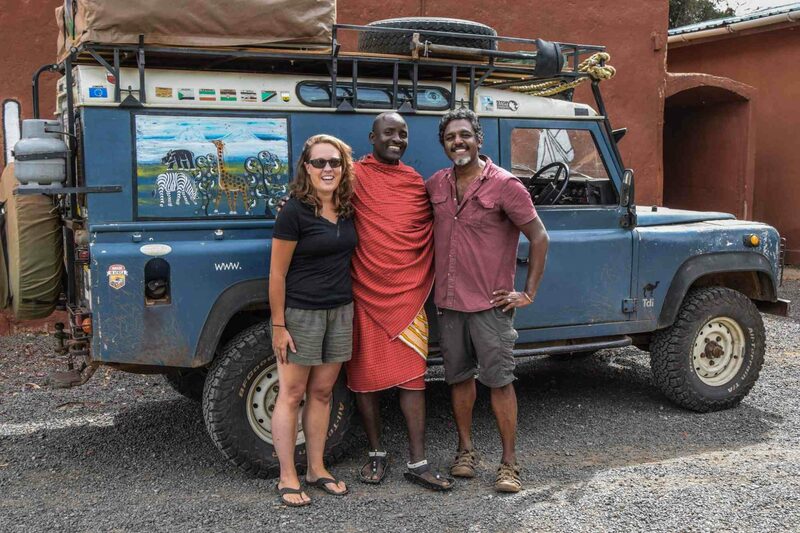 There’s no two ways about it, Defenders, especially those as well travelled as Maggie, have character, and by and far, our favourite part of travelling through Africa in a Land Rover is the people we meet along the way. Living in a Defender is a great way to start conversations with people from all walks of life: locals, tourists and fellow overlanders alike. “What do you do for food?” “Where do you sleep?” “How safe is it?” Those are just some of the questions we get from tourists we meet. When we first started our journey, we were particularly amazed by how many people in the remotest parts of the world recognise and admire the Defender. “This is a strong vehicle!” locals often told us. “Have you really been to all these places?” they would ask, admiring Maggie’s many bumper stickers from places visited by us and previous owners. We also hear a lot of stories from Land Rover owners and admirers. There have even been a few occasions where we have been invited to stay with people who initially approached us just to admire our vehicle. 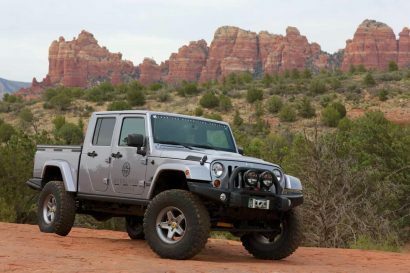 Looking back on these times, we often wonder if we would have as much fun in any other vehicle. The Namib desert at sunset. The sandy back roads of Botswana’s Okavango Delta. The outskirts of Tanzania’s Uluguru Mountains. We will always remember travelling through these beautiful places for their stunning scenery and majestic wildlife. And as places Maggie has broken down and left us stranded. 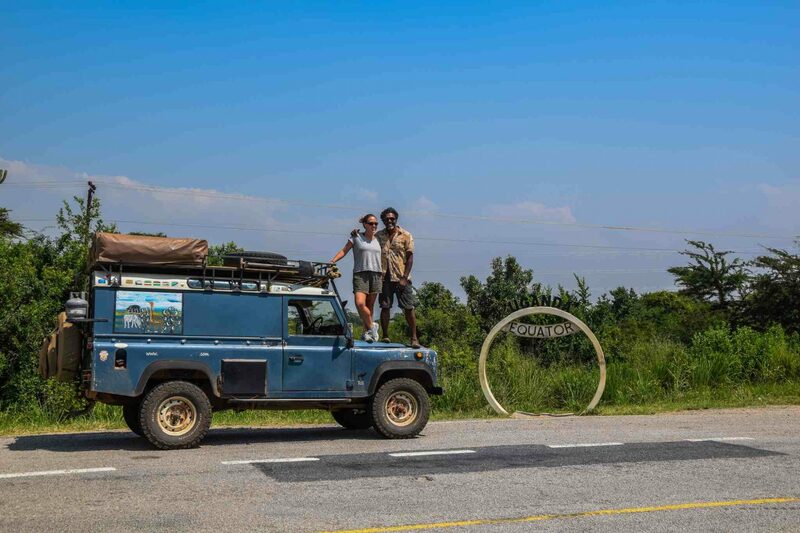 With over 250,000 miles on the clock and seven expeditions through Africa since 1997, we have learnt the hard way to expect the odd breakdown. Thus far, the biggest expense of life on the road in a Defender has been on parts and mechanics. Many years of driving on poorly maintained roads has taken a toll on our beloved Defender, and on our pockets. Some breakdowns were worse than others. In the Namib desert, Maggie blew a hole in the engine block. We were devastated and off the road for 6 weeks. In the Okavango Delta, she had a loose connection on the starter motor. We were back on the road the next day. 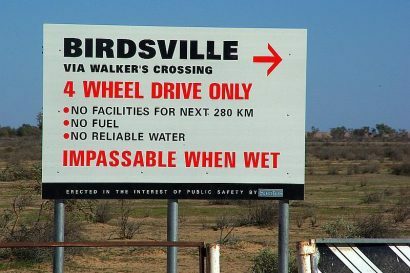 On a long road trip through remote areas, the location of the breakdown is sometimes just as important as the breakdown itself. We’ve learnt the importance of remaining calm and working out logically how to recover the situation. Our first step is always to try to diagnose and fix the problem ourselves, if possible. Those not mechanically inclined (like us) will eventually become so after a few months with Maggie. But even with difficult breakdowns, we’ve learnt never to worry. 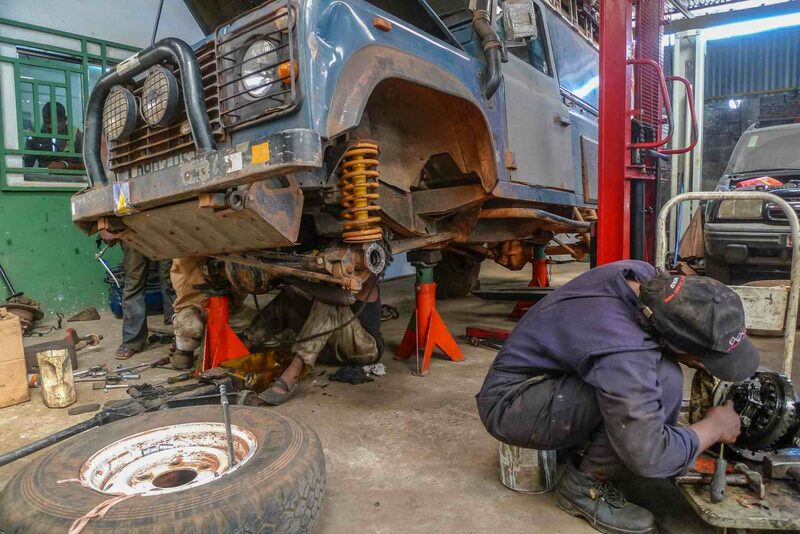 No matter where you are in Africa, there is always a mechanic nearby who knows how to work on a Land Rover. Where parts are scarce, they often have resourceful ways of fixing the vehicle. After breaking down in the hinterlands of Tanzania, we were taken on the back of a motor bike to Ahmed, an engineer whose father had taught him to work on Tdi engines from an early age. No push rods in town? No problem. He made some for us right there in his shop, and we were back on the road within the week. Some of our fondest memories from our journey in Africa have been the amazing places we’ve visited. If there’s one thing we’ve learnt about travelling in this region, it’s that the most stunning places are often the hardest to reach. 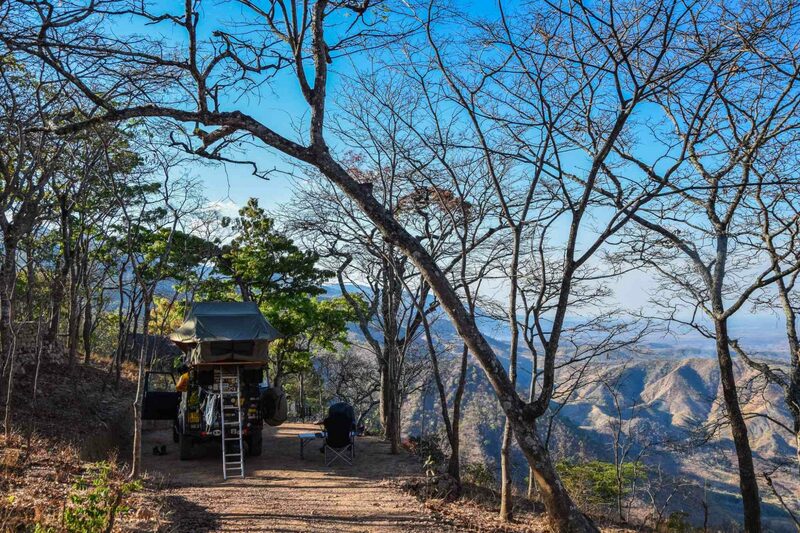 This is where living in a Land Rover makes all the difference—difficult terrain is where Maggie comes to life. After a long, tiring drive over rough terrain, there’s nothing better than being rewarded by spectacular, unspoilt views. Take Livingstonia, Malawi, for instance. After 15 kilometers of steep, rocky 4×4 trail, we were rewarded with a campsite offering stunning views over the Great Rift Valley and Lake Malawi (pictured below). 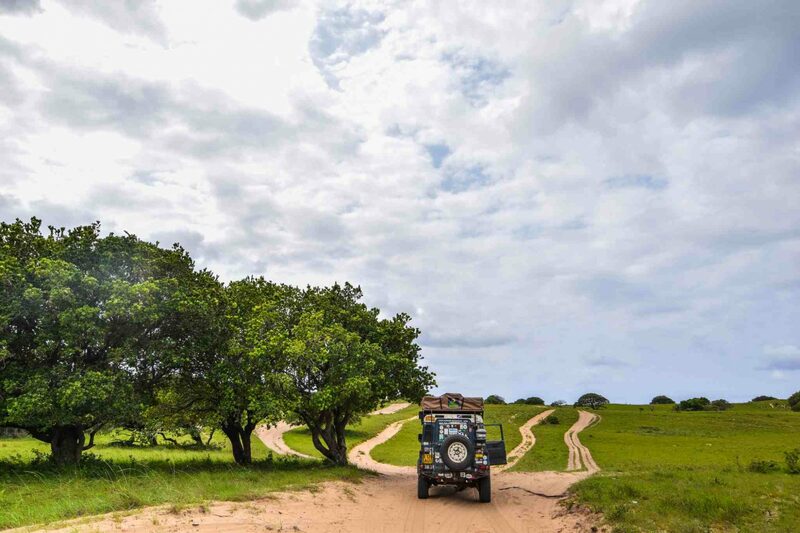 Another amazing memory is driving the 32-kilometer-long 4×4 sandy coastal path in the iSimangaliso Wetland Park in South Africa. After a day of dune driving, we were rewarded with camping on a beautiful stretch of isolated beach, whose most numerous inhabitants were endangered sea turtles. 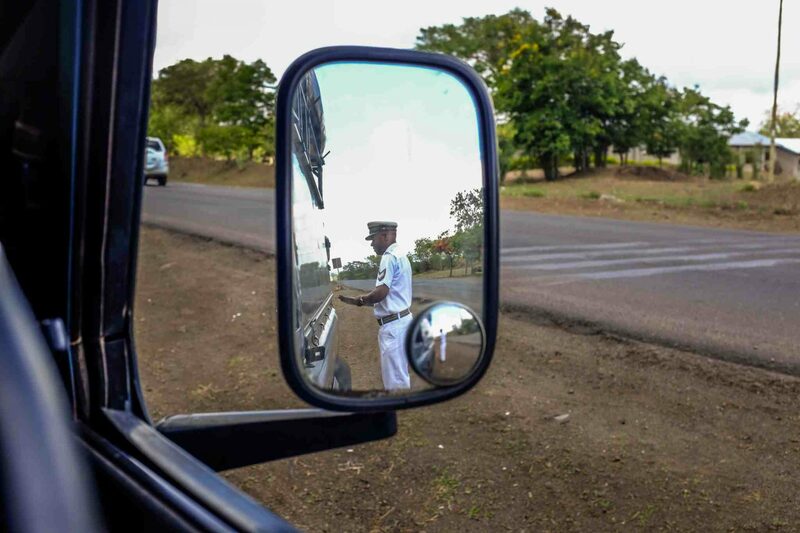 After a year on the road in Africa, we’ve lost count of the number of times we’ve been stopped by traffic police. Usually not for speeding. Maggie’s 200 TDi diesel engine rarely exceeds 55 mph. And even then only when travelling downhill with a tailwind. Ask anyone who has travelled overland in Africa and they all say the same thing: traffic police find inventive ways of collecting fines. Usually this involves diligently searching vehicles for even the most minor violations of traffic laws. Over the years, “violations” over which we’ve been threatened with fines include: lacking possession a road map of the city we were driving through in Nigeria, not stopping at a broken traffic light in Botswana, and not having the correct pressure in our fire extinguisher in Malawi. 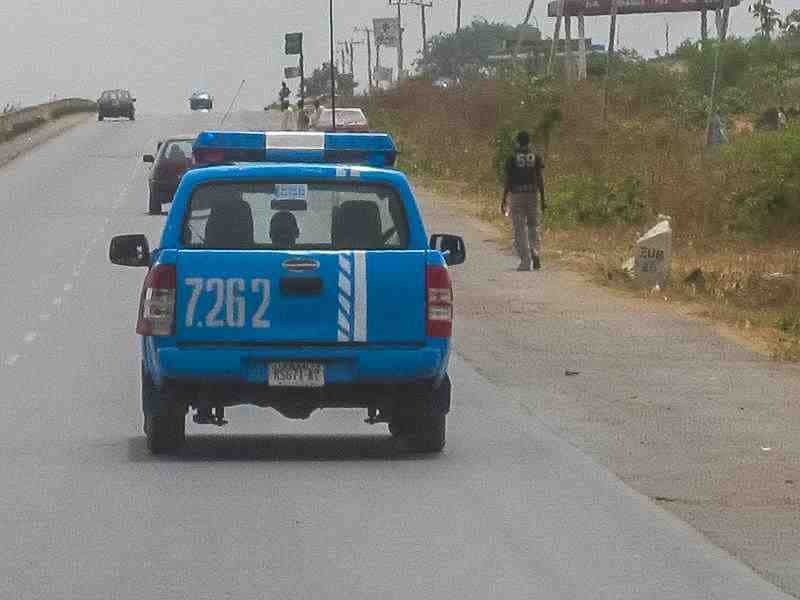 The two countries in which we have had the worst experiences with traffic police were Nigeria and Tanzania. In Nigeria, Maggie was impounded for a day by police who insisted we convert her from a right-hand drive to a left-hand drive vehicle. This was despite having the law, and all the necessary documentation and import permits, on our side. With the help of a local lawyer we met the previous day in a traffic jam, we managed to escape the situation without paying a bribe. In Tanzania, we found police officers, who were stationed in nearly every town, using What’s App to enforce speed limits. Of course we know that What’s App is not capable of recording the speed of passing vehicles. However, try keeping your patience while explaining this to officers stationed every 10 kilometers on a 500-kilometer daily drive. Unable to keep our cool any longer, we learnt our lesson and headed for the back roads! Keeping Maggie and all our equipment clean is a constant chore, and a source of many arguments. Anyone who drives a Defender in Africa knows how difficult it can be to keep the dust out; driving a Defender can often feel like navigating a hoover through a sand storm. 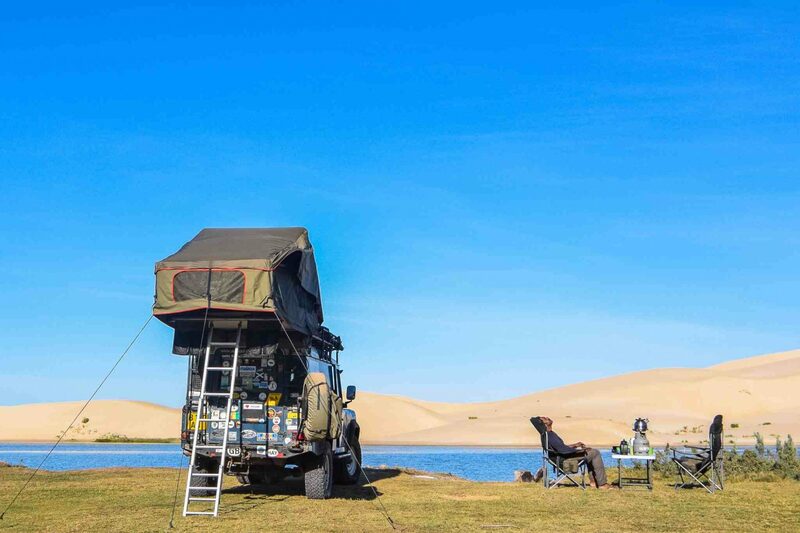 In Namibia, for example, where few roads are paved, after driving a few hundred miles in Maggie it felt like like there was more sand in the vehicle than in the whole of the Kalahari. Not to mention our dirty bodies. In hot temperatures, sweat and dust are horrible bedfellows. And when showers are few and far between, we’ve been forced to develop innovative ways of keeping clean. To this end, we’ve found that a portable shower, a few packs of wet wipes, and some sanitising gel can go a long way. For us, it was an act of significant courage to leave our London lives behind for the meagre comforts of a cook stove and a roof top tent. But after a year on the road, we can confidently say that the decision to take time off to travel through Africa was a life-changing experience. Although living in a Land Rover can be challenging, life on the road forces us to focus on the journey rather than the destination. The most rewarding experiences we’ve had were in unexpected adventures and happenings. Not to mention the people we’ve met and places we’ve seen along the way that have left permanent impressions on us. After Noel’s first overland journey through West Africa and Southern Africa, we met and bonded over our love of travel and adventure. Two years later, we were married. Five years later, we were back on the road. We’re so excited to be able to share our experiences with everyone through our blog and articles like these.